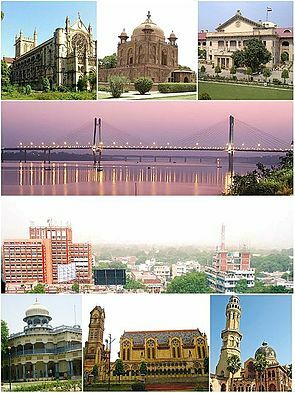 Clockwise frae tap left: Aw Saunts Cathedral, Khusro Bagh, the Allahabad Heich Coort, the New Yamuna Brig near Sangam, skyline o Ceevil Lines, the Varsity o Allahabad, Thornhill Mayne Memorial at Alfred Park an Anand Bhavan. 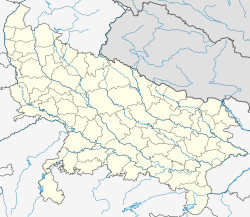 Allahabad, an aa kent as Prayag is a ceety in the Indie state o Uttar Pradesh an the admeenistrative heidquarters o Allahabad Destrict, the maist populous destrict in the state. ↑ "City of Prime Ministers". Government of Uttar Pradesh. Retrieved 16 August 2014. ↑ Mani, Rajiv (21 May 2014). "Sangam city, Allahabad". Times of India. Times Group. Bennett, Coleman & Co. Ltd. Retrieved 16 August 2014. ↑ "Census 2011" (PDF). censusindia. The Registrar General & Census Commissioner. Retrieved 25 June 2014. ↑ "Urban Agglomerations/Cities having population 1 lakh and above" (PDF). censusindia. The Registrar General & Census Commissioner,. Retrieved 25 June 2014. This page wis last eeditit on 16 Februar 2018, at 22:17.